The Coronary band is the soft skin that the horse's hoof grows from. Just like the cuticles on our fingers. 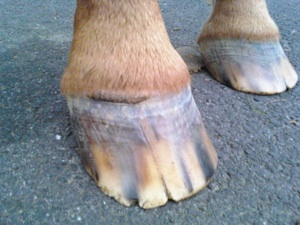 If this Band is ever damaged in any way the hoof may not grow right, and you must contact a vet or your Farrier as soon as possible. 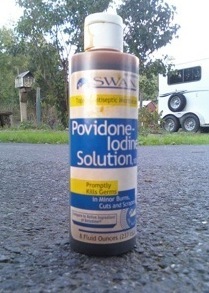 A horse/Pony can go lame if this is not treated properly. Jack blew out his Coronary band and it had puss coming out. I'm not sure how he did it but we had to contact help right away. I ran inside and told my mom to call our Farrier, I said it was an emergency. She got the Phone and came out side to see what happened. The farrier came with in an hour. He looked at Jacks Hoof and told us that it looked like a blow out and we needed to call our vet to have them take a look. 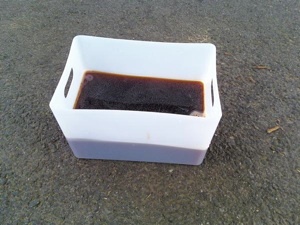 The Farriery suggested that we put white lightning liquid mixed with white vinegar until we could get a hold of our vet. I talked to the vet that same day and he can over to see what had happened. Our vet said that he must of had an abscess and it made its way up and then blow out the skin, which would be a "Blow Out". 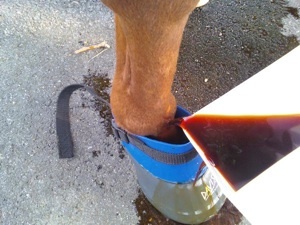 Our vet told us to soak Jacks Hoof for 5 days depending on how fast the wound heals. Then he would come back and check on Jack. We had to soak it in warm water with Iodine and Epson salt. Epson salt helps pull any puss out and the iodine helps kill the germs. This will prevent the blow out from getting infected. I mixed it all together in a small bucket. This is Iodine on the left and Epson salt on the right. After I mixed the products together I had to get my medicine boot for Jack. 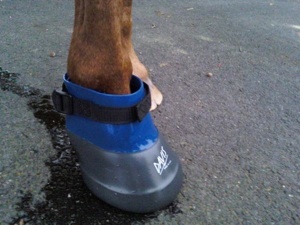 A medicine boot is a boot that goes over the hole hoof and you can poor liquid medicine in it. These can be purchased on line or at a horse store. 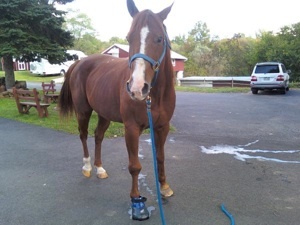 we had to let his hoof soak for 30 minutes. After the boot was on Jack, I poured the medicine in and waited for 30 minutes to be over. After 30 minutes was up i put Jack in the stall for the night since he was limping. 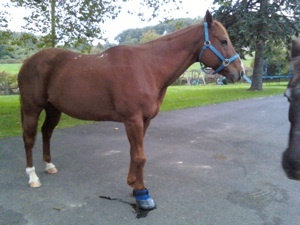 I went out to check on Jack and to soak his hoof for another 30 minutes. He was standing happily in his stall and Jazzmine in the stall next to him. I took both of them out while my mom was mixing the medicine together. I noticed that Jack wasn't limping as much this time then yesterday. Jack was feeling better and the abscess was also looking better then it had the day before. Once again I put the boot on and poured some medicine in. Jack calmly stood with the boot on. It probably felt good to have warm water with the epson salt and iodine because epson salt is supposed to be relaxing. 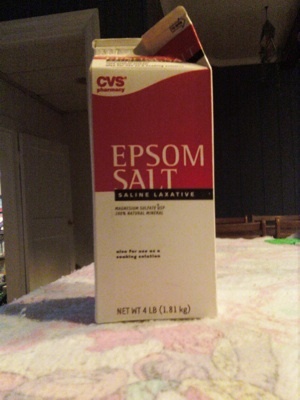 People like to take epson salt baths because it sooths the body. 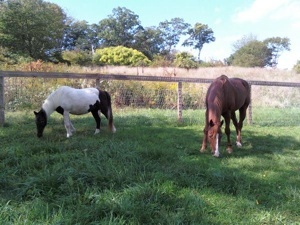 When I took the boot off I set Jack and Jazzmine in the field to eat some fresh grass. Since Jack was looking and feeling a little bit better, I let him spend the night in the field instead of the stall. 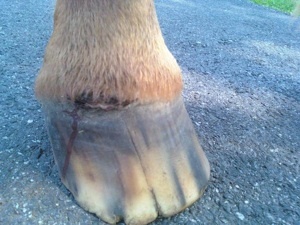 Jack's hoof is starting to look better now and it is heeling very well. I still wont ride Jack until his blow out is fully heeled. When I went out of get jack followed me to the driveway. I still noticed that he was limping, but his blow out wasn't as open anymore. I had Jack stand while his hoof soaked and I took some pictures, Jazzmine also stood with him. She is very attached to Jack and throws a fit if i do not bring her out when he is getting his foot soaked. 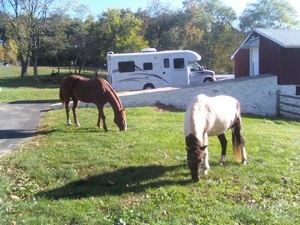 I don't want to upset old Jazz to much so i allow he to follow Jack and I out of the field and onto the driveway. After Jack's hoof was finished soaking I put him back in the field. I never covered Jack's hoof during this process because the injury needs to have air contact to help dry out the area and heal properly. I went to get Jack to once again soak his hoof. The blow out was closed and it looked a lot better. 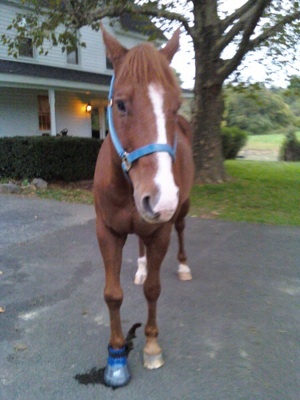 It made me feel relieved to know that my horse was heeling. As you can see from the picture below the injury has scabbed over and is on its way to a full recovery. Notice the difference from the first day and the fourth day. Jack's blow out is now starting to heel! The first day of the blow out incident, there was pus and blood coming out of his hoof and now it is closed back up. Almost perfectly new! The warm iodine water mix must feel good over his cut since he never tried to pull his foot back or run away. The last day of recommended soaking I decided not to soak Jacks hoof because his blow out was closed up and soaking it wouldn't have done anything. Instead I let Jack and Jazzmine eat grass in the front yard. The Vet came after 5 days and saw how much Jack had gotten better and told us that we can stop soaking it. He said at this point soaking it would not make a difference. Now we just have to let the blow out heel on its own.